View from back deck Cabin 5. This cabin is a favorite because it has the best view of Carson Peak. Relax with a view Living and loft area Living area with futon couch Apartment sized fridge Bedroom with queen bed. Full bath Bathroom with tub/shower combo Kitchen with everything you need Dining area by the old fashioned wood stove Loft area with three twin beds Kids will love the loft Looking up at the loft Best deck around. 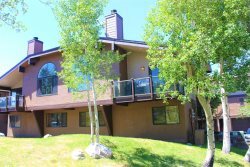 Enjoy our community of June Lake and surround yourself with the beautiful High Sierra Nevada Mountains, crystal clear alpine lakes and a wonderful vacation experience. Our town is a small town, located between Yosemite National Park and Mammoth Lakes that has four seasons of fun and relaxation. Come and discover the Fall colors, perfect winter powder, and trophy Brown Trout. Come and stay in one of our exceptional A-Frame style June Lake cabin rentals at the base of Carson Peak with views of the Ansel Adams Wilderness. Here's a good read on the history of the Four Seasons area of June Lake. Cabin was perfect for our weekend getaway. We really loved relaxing on the deck amongst the Aspens and the view out of the big a-frame, especially for stargazing at night. The view from the cabin is stunning! We enjoyed our stay and looking forward to ou next stay. Quiet, private, clean and comfortable....I'll be back! Except for the dirt factor, we had a great time, and appreciated being able to bring our dog. The view off the balcony and from the living room in Unit 5 at Four Seasons is stunning. A million dollar view!